O.J. Simpson, who was sentenced In a kidnapping and robbery trial. Every single time O.J. Simpson appears on the television screen, I wind up remembering that he is still alive. That after all he has gone through, O.J. is not yet at the point where white people are spitting and urinating on his grave. The latest time this happened was just Friday, the day of Muhammad Ali’s public memorial, when PBS’ Charlie Rose show had a segment on the 10-hour, five-part documentary series O.J. : Made in America, which debuts tonight on ABC and continues next week on ESPN. It’s the latest product of ESPN’s popular 30 for 30 documentary series. My memories of this period are pretty stark. Cable television had exploded from a 60-channel universe to a 100-channel one. CNN had new 24-hour competition in MSNBC, and more coming. Overseas television news bureaus were being cut, and television newsmagazines—not sober, international investigative ones like CBS’ 60 Minutes, but ones dealing with sensational domestic issues, especially murder and mayhem—began to proliferate. TV’s new use of extensive, wall-to-wall coverage, heretofore used only during assassinations and attempted assassinations of U.S. presidents, was perfected during the 1991 Gulf War. That moneymaking momentum had to continue. So extensive and sensational coverage of lurid public events—the Clarence Thomas-Anita Hill sexual harassment hearings of 1991; the publicly exposed sexual exploits of 1992 presidential candidate Bill Clinton; the case of figure skaters Tonya Harding and Nancy Kerrigan in 1994 and child-molestation charges against Michael Jackson the previous year—had allowed cost-conscious television news to create a tabloid television culture. And then in June of 1994 came former football star, TV pitchman and movie actor O.J. Simpson. 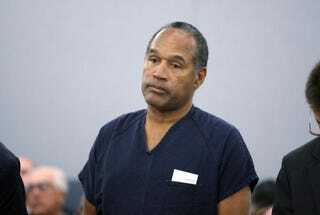 Accused of murdering his white, blond ex-wife, Nicole Brown Simpson, and her friend, Ronald Goldman, Simpson was broadcast live on TV being chased by police in a white Bronco. The next 16 months of television were swallowed by what local and national television outlets were calling “The Trial of the Century.” (My nickname for it back then was “Othello.”) Cable and local weekday non-network-affiliate TV programming was practically suspended during the weekday as the live feed kept the nation informed of every (mostly) boring minute. America learned about O.J.’s high-powered legal team, especially Robert Kardashian (the now-dead patriarch of the reality-TV clan) and a very well-dressed, very articulate black man named Johnnie Cochran. The October 1995 verdict, O.J.’s acquittal, created what was then called a “white riot”—angry whites writing newspaper and magazine articles, late-night TV hosts joking about Simpson being a murderer for the next year, and Rush Limbaugh and other right-wing radio hosts exploding in popularity. (Much of black America saw a black lawyer achieving a victory over a white racist judicial system and a white racist Los Angeles Police Department.) This “white riot” over Simpson—a politically and socially “colorless” black man and the ultimate assimilator—ironically fed the fire for black men to assemble for the first Million Man March. I have tried very hard to forget this time. The period between the end of the Cold War and 9/11 had a ridiculous level of promise. It was largely squandered. The smoke from the 1992 Los Angeles disturbances still in the air, the culture became shallow while Clinton fought to get in and remain in office. Politically conscious rap got its lunch eaten by The Chronic, a herald for a coming decade of gangsta hip-hop music. It was the kind of period where recently freed Nelson Mandela was photographed with the Spice Girls. Wall Street was booming, and consumption and increased entertainment were in vogue. One historian even said that it was the end of history, while an increasingly popular black scholar said that black America had developed a nihilistic streak. America’s optimists were convinced that the entire planet was going to drive on the “Information superhighway” (as it was then called), and a new realm of world social equality was, somehow, going to be born from that experience. O.J. stands at the center of the 1990s, essentially a frat-party decade for America’s rulers. Post-9/11 society has been less forgiving. Simpson, in jail since 2008 for robbery and kidnapping, has changed American 21st-century culture in fundamental ways. Forever parodied as “Jackie Chiles” on never-ending Seinfeld reruns (the sitcom “about nothing” being the quintessential 1990s product! ), Cochran became a household name in black communities thanks to the O.J. trial, and the trusted brand of an injury law firm that was a fixture among weekday local TV commercials. Orange juice permanently lost its nickname. Murder trials covered live on cable television no longer have a special appeal. And professional black athletes are “free” to be as misogynist and domestically violent as their sports leagues, the courts and the American public will allow. Post-O.J. culture is one without the illusion of innocence, and Simpson has gone from colorless to invisible. Like the recent FX docudrama miniseries The People v. O.J. Simpson, this forthcoming documentary series attempts to find him, huddled, in the white shadows. Todd Steven Burroughs, an independent researcher and writer based in Newark, N.J., is the author of Son-Shine on Cracked Sidewalks, an audiobook on Amiri Baraka and Ras Baraka through the eyes of the 2014 Newark mayoral campaign. He is the co-editor, along with Jared Ball, of A Lie of Reinvention: Correcting Manning Marable’s Malcolm X and the co-author, with Herb Boyd, of Civil Rights: Yesterday & Today.